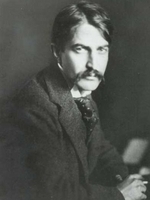 1 Born on November 1, 1871, Stephen Crane was an important American novelist, short story writer, poet, and journalist. His writings were not only of the realist style but were also early models of naturalism and impressionism. Of Crane's five novels and countless numbers of poems and short stories, it was The Red Badge of Courage that brought him international fame. 2 Crane was born in Newark, New Jersey, to parents Jonathan and Mary Crane. He was raised in New Jersey and New York and was the fourteenth child born to the Cranes. His father, a Methodist minister, raised the family in a devout manner. As a child, Crane was often sickly, yet he was still very curious. He taught himself to read by age four and learned how to write by the age of three simply by imitating his brother. His first surviving poem, "I'd Rather Have--," was written when he was eight. Although Crane was not enrolled in school until January 1880 at age nine, it was said that he was able to complete two grades in six weeks. 3 When Crane was eight years old, his father died. His mother moved to Roseville and sent Stephen to live with his brother Edmund. He and his sister Helen later moved in with his brother Townley and his wife Frannie, who stayed home to raise the children. Agnes, Crane's older sister, also moved in to help raise Stephen and Helen. Unfortunately, Stephen was still to experience sadness. Townley and Frannie's two young children died, and soon after Frannie died in 1883. The next year his sister Agnes died. 4 Despite the sadness in his life, Crane continued his schooling. At age fourteen he wrote his first story, "Uncle Jake and the Bell Handle." He enrolled at Pennington Seminary in 1885, the same school where his father had been principal for many years. Sadly, Crane experienced an additional death when another of his siblings, Luther, died. Crane continued at Pennington for two years until he left for Claverack College, a type of military school. Although Crane was seen by most as friendly, others considered him moody and rebellious. He did, however, move up in the ranks of the student battalion. 5 During the summer of 1888 (and every summer until 1892), Crane worked as an assistant for his brother Townley at a New Jersey news bureau. He published his first article about Henry M. Stanley, which appeared in Claverack College's Vidette in 1890. During this time, Crane's family convinced him not to go into the military but to transfer to Lafayette College in Pennsylvania in order to pursue a mining engineering degree. Crane quickly became involved in the literary society. However, Crane transferred to Syracuse University after only one semester where he was a non-degree student in liberal arts. Crane frequently skipped classes during his attendance in all of his schools. Despite his lack of focus in most areas of school, Crane did focus on his writing and began experimenting with style and tone in different subjects. He wrote a fictional story, "Great Bugs of Onondaga," which was published in the Syracuse Daily Standard and the New York Tribune. He finally decided college was useless and became a full-time writer. Prepare for an entire week at once!